Planning a wedding is overwhelming enough, I hardly had time to think about the engagement photos. 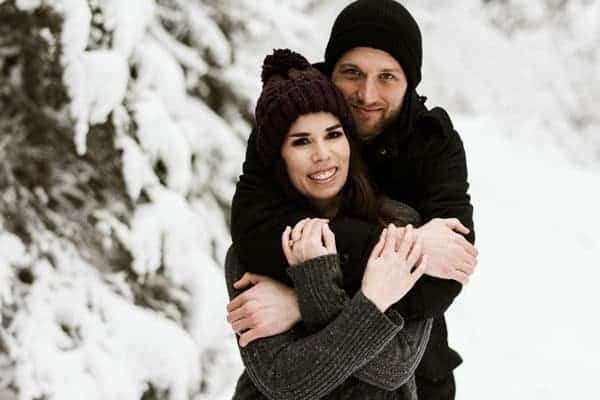 Here are 10 Tips for Planning a Winter Engagement Photoshoot. 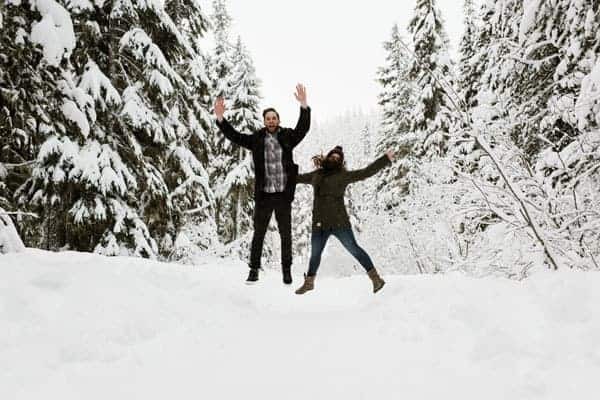 We took our engagement photos in Mount Hood, Oregon on a perfectly snowy day in January. 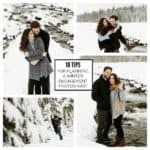 Today I am sharing a little bit about our experience, and some helpful tips if you’re thinking about planning a winter engagement photoshoot whether it’s in Mount Hood or elsewhere. When we first got engaged it was the end of February, we weren’t living in the same state yet and we had a pending move within the following 6 weeks. Needless to say, all thing wedding planning got put on the back burner until we were finally settled in Oregon. The both of us love snowboarding, it’s something we share and always provides time for us to get away from the everyday stress, and spend some quality time together having FUN. So, when he proposed last year when we were snowboarding, it was very us. It made our engagement even more meaningful. Initially, I tried to plan a winter destination wedding, but things just didn’t align, so we went with a second option that offered a little bit of both. 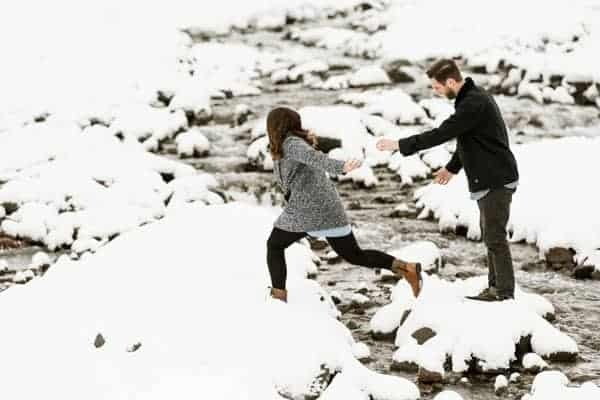 However, since we aren’t getting married in the snow, I knew I wanted to do our engagement photos in a winter setting. 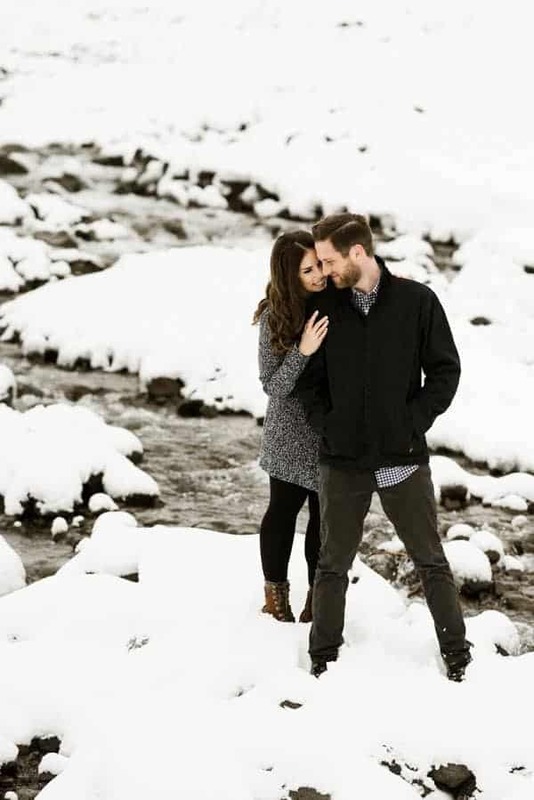 As you might imagine, planning a winter engagement photoshoot comes with a couple of challenges. Where we live, early winter November/December is always questionable as to whether or not there would be snow. Plus, with the holidays, I knew our photographer would be busy with family portraits, so we decided to wait until the after the New Year to take them. It was way worth it. I am by no means an expert, and obviously, I had no idea how to plan an engagement shoot. 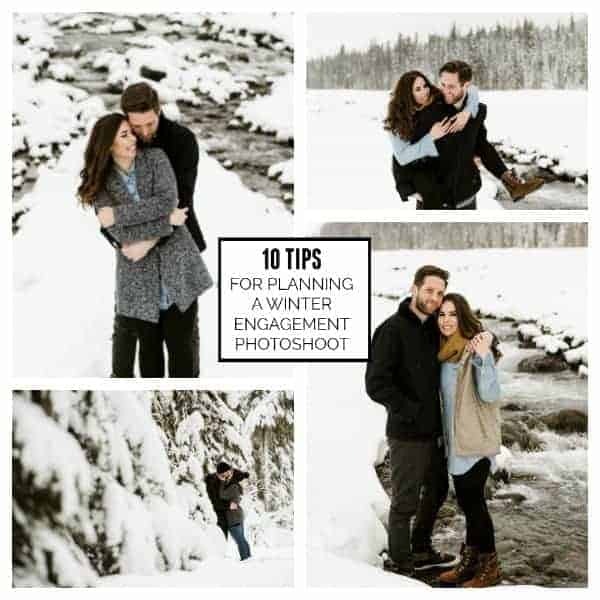 These are just helpful things I felt others might want to know if their planning their own winter engagement session. I also asked our photographer, Kimberly to weigh in on some of her thoughts as well as Lori, my hair and makeup artist from Edge Hair and Makeup for her input. These two are my dream team and I can’t wait to work with them again at our wedding! When we were looking for our wedding photographer, we knew we wanted our package to include engagement photos. A majority of the cost for your wedding photography is usually attributed to the 8+ hours they spend with you on your wedding day, but the engagement session feels like you’re getting a bonus. For us, we want to go to back to Mount Hood since that is where we got engaged. 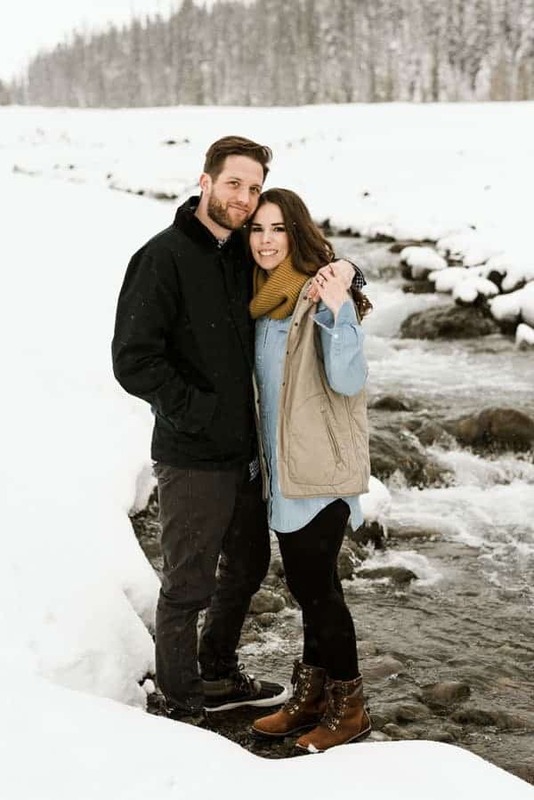 Our photographer Kimberly gave me some advice, “it’s important to me that my couples walk away from the experience feeling like it wasn’t just about taking photos but it was about making memories too! Typically, couples will want to shoot at least two different types of photos during their engagement shoot. Try to scout out your location to see if there are multiple options ahead of time. In our case we had the river on one side and on the other side of the parking lot was the wooded area which allowed us to get a variety of shots. I spent quite a bit of time online seeing what the options were to shoot in Mount Hood. We weren’t willing to snowshoe very far for our photoshoot, so we needed a location that had parking and wasn’t too far off the road, plus it needed to be plowed in case it was really snowy! A combination of all of these things can be hard to come by sometimes. You may also need some sort of parking permit if you’re on national land, and be sure you inform your photographer of those details as well. We wanted to be sure our photographer would be comfortable shooting in an outdoor, snowy environment. First, I started on Kimberly’s website to see if she had done these types of shoots before. This is especially important if it involves travel for your photographer. Be sure to ask questions and be sure they’re willing to travel and if there are any extra costs associated. The weather in the winter is obviously unpredictable. When we first planned our shoot, our photographer agreed that we should plan a backup weekend in case our first date didn’t work out due to weather. For a busy photographer, this can be a huge ask, but that is one of the benefits of having your photoshoot during a less busy time of year. I couldn’t agree more Kimberly! No photographer is going to be able to exactly replicate the images you found on Pinterest. However, when we arrived at the photoshoot, I showed our photographer a few of our inspiration images so she had some idea of what we were looking for. Romantic, whimsical, funny, playful. You want to get a wide variety! Kimberly suggests to just, “be you. Communicate well with your photographer…share with them your personalities… are you serious, silly, romantic, playful, shy. This helps your photographer truly bring out your best you and truly capture your authentically. 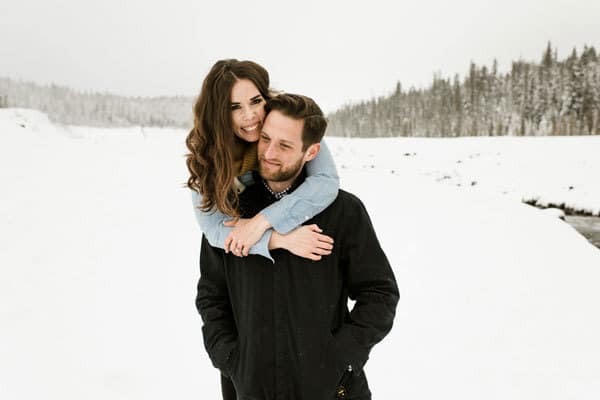 You’ll also feel super comfortable with your photographer because they have a better understanding of how to work with you and how to capture you and your fiancé in a realistic way. Without trying to make you do things that you don’t fit your personality. Most of the thought that went into our outfit plans were the shoes and the jacket, at least for me! How can you keep your feet warm, dry and cute all at the same time? Personally, I prefer Sorel and Columbia for cute waterproof boots! We planned our outfits the night before the shoot, and once I actually sat down to think about it, I realized that couples were WAY more coordinated than we had planned. But you know what? I am so happy we didn’t over coordinate because that’s not us. Kimberly says, “I think it’s super important to stick with a stylized theme that reflects your relationship with your finances, the life style that you enjoy, and also… colors and themes that will fit will with your home, as hopefully you will enlarge your images to display in your home. Keep in mind that whatever you choose to incorporate into your photo shoot, it also will look great along with the style and decor of your home.” I never even thought about that! We laid out some different options on the floor and decided on two outfits each that complimented each other. We’re a pretty relaxed couple, so it wouldn’t have made sense for me to be a dress or anything overly fancy. Being comfortable was the number one priority, besides looking good, HA! You’re likely to get wet and cold when you’re shooting outdoors, so be prepared with a back up outfit for after your shoot. I also threw some hand warmers in my pockets so I could quickly warm up my hands between shots if I needed to. Our second outfit included beanies (because I wear them ALL the time!). So, we have half our photos with my good hair and half the photos with a beanie. I am not someone who wears a lot of makeup in my day to day life, I never have been and I have no idea what I am doing! I can also be a penny pincher, so at first, I just thought I would do my own hair and makeup for our engagement session. The more I thought about it, the more I felt I was okay with making this investment, because these are some of the most important photos you’ll take together. Again, I booked a vendor that offered a package that included an additional hour-long hair and makeup session. I could have saved that for our rehearsal dinner, or bridal shower, but I opted to use it for this purpose. It was worth every penny. It made me feel more confident in myself when we were taking those photos. Prior to my engagement session, I did my hair and makeup trial with Lori, so we got to know each other a bit and she got to know my style. This was super beneficial so she could capture my look. Lori also convinced me to do the fake lashes and it 100% makes a difference! I wanted to especially thank Kimberly of Kimberly Kay Photography and Lori from Edge Hair and Makeup for helping make our day so special! We’re less than one month away from the big day! For more photos from our engagement shoot in Mount Hood, please see Kimberly’s blog post about our session together. All photos are © Kimberly Kay photography. Beautiful! We are actually planning on getting our engagement photos done on Mt. Hood in just a couple of weeks! Can I ask which snow park you were at? We were planning on Trillium Lake but realized it would be a 2 mile snow shoe trip each way! HA! That’s exactly why we didn’t go to Trillium! We were at the big snow park off highway 35 in between Timberline and Meadows. I call it the Lava flow zone. If you can get there early before the crowds I’d recommend that. I Goggled it and its called White River Sno Park. Congrats to you!! LOVE the pictures I hope it is all you have dreamed of I have been married 39 years and stil very much in love. Good luck. Love, Love, Love all of the photos! It’s a very special time in your life! 🙂 Have fun! Thank you so much Misha! I think it’s always uncomfortable to be in front of the camera for such important events but our photofrapher was so talented, she helped us relax and have fun! I love the photos you posted!! When we visit our son who lives in Vancouver, WA we often drive to Mt Hood. While he hikes you will find us at Naked Winery and window shopping in the cute town. Wishing you the very best with upcoming wedding. That sounds wonderful Carol! I LOVE the Hood River area, and it’s so pretty in the summer on a clear day when you can see the mountain towering over everything and it’s still snow capped. Thank you for your well wishes!